We are back again with another ultrasound case of the month !! Brought to you by Amber Hoek. Emergency Medicine Resident, HAGA Teaching Hospital, The Hague . She came across this case during her Emergency Ultrasound Rotation at the Emergency Department of the Westfriesgasthuis in Hoorn. A unexpected finding during a routine EFAST….with a brilliant clip….Enjoy !! a 27-year-old male visited the ED with chest pain and respiratory distress. 3 weeks ago he was involved in a high speed motor vehicle crash, and fell from a dyke into the water. He refused to go to the hospital, however the day after he went to the ED because of chest pain on the left side. The Emergency Physician did a full physical exam and made a chest X-ray and shoulder X-ray. Only a left clavicle fracture was found. Vital signs: blood pressure 134/95 mmHg, heart rate 112/min, Sat. 100%, temperature is 37.8 °C. Auscultation: decreased breath sounds on the left with rales. -What is your most likely diagnosis? -What would you do next? -What’s your diagnosis now and what would you do now? 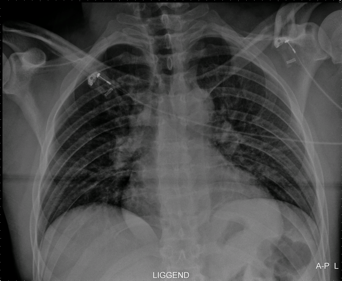 To see the answer and the outcome of this case of the month , check out EMDutch in 2 weeks …. What a great case! I (as a non-ultrasonographer) organized an education day today at our hospital about abdominal trauma and FAST. I found this great site: emergencyultrasoundteaching.com. Maybe it is something for you guys.